Crypto mining is a process that verifies crypto transactions. In most cases, verifying transactions generates new units of the cryptocurrency. As illustrated in this crypto mining basics infographic, the process might be complicated, but it's not hard to understand how it works. Perhaps you are aware that some people made a fortune by mining specific coins, especially Bitcoin. Maybe you are considering if you could join the race too and earn some quick money. If this is the case, the infographic below is just for you. 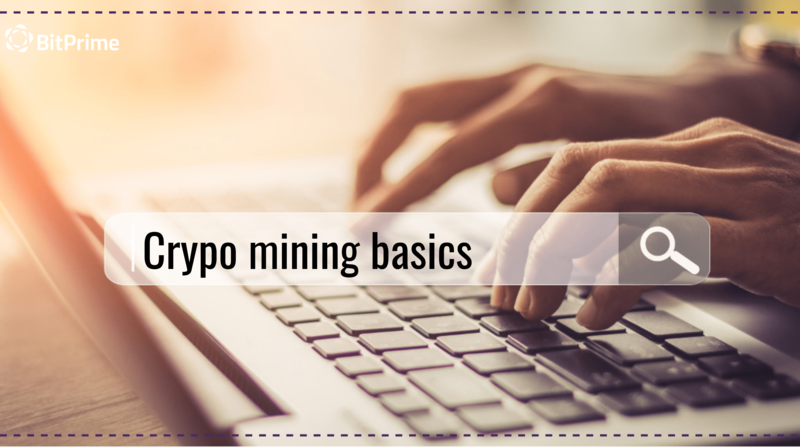 You'll learn the basic principles of cryptocurrency mining, the blockchain technology that powers this, and what's needed to join. But first, let's take a glance at what exactly crypto mining is, and whether you could become a miner today. Let's say you want to send 50 bitcoins to your friend. You do this through the Bitcoin network maintained by different users, none of whom is central or more authoritative than others. Before your friend receives 50 bitcoins, the transfer has to be registered and then verified by the network. The first node on the network that verifies the transaction receives 12.5 freshly generated bitcoins as a reward. Miners later sell, store, or send these coins to other people. This process is called mining, and it involves your computer solving complex mathematical puzzles to verify transactions. Satoshi Nakamoto introduced this method to prevent double spending. Is It Profitable to Mine Cryptocurrencies? It depends on which coin you want to mine. If you're thinking about Bitcoin, you should know that you are not only competing against professional colossal mining farms that have millions of times better machines than you but also against plenty of other regular users worldwide. As you can see, Bitcoin competition is fierce, and you don't really stand a chance if you are going to do the so-called "solo mining". On the other hand, if you're interested in mining a lesser known coin that you believe could surge in value someday, then you could install its miner and start the job of mining. Additionally, we recommend using one of the online mining calculators to check profitability. For other facts, tips, and tricks check out the infographic below. We focus on Bitcoin, Bitcoin Cash, Ethereum, and Litecoin.